1101: Chevy Camaro PHANTOM Hidden Headlight Grille w/Option of Removable or Fixed Headlight Bezels. DJ Grilles is known for it's extreme high quality, modern innovations and true custom design in aftermarket grilles and they have left the pack behind once again with this all new custom PHANTOM mesh style grille with fixed or removable headlight bezels. The grille is constructed of stainless steel with frame and mesh construction. DJ's famous badge is machined into the center of the grille. Available in either a Combo package which includes upper and lower grilles together or upper and lower grilles are available separately. Please make your selection above. The grille comes in four variations from all black with fixed bezels to black and brushed stainless silver with removable bezels. The removable bezels are held on by one race style fastener which is released with a 90 degree twist and can be accomplished in under 6 seconds. (See video clip below.) May be illegal for use in some states. All hardware and installation instructions are included. Backed by manufacturers 1yr warranty. Made in USA. Please allow 5-7 business days before shipping. 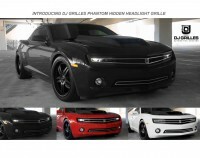 Tell your friends about the Chevy Camaro PHANTOM Hidden Headlight Custom Grille. Share this product on Facebook, Twitter, MySpace or send an email to a friend!